The other day I received a phone call from a gentleman living in the mid-west. He has never visited the Finger Lakes and asked me what exactly they were; I don’t believe he has much time to check out information on them since he is working six days a week. He jokingly shared the common misconception that New York State is all one big city from the shores of Long Island to the Pennsylvania boarder to the shores of Lakes Erie and Ontario. I don’t think he believed it, but he did start me thinking about how many folks who call me at the Historical Society have never heard of the Finger Lakes and don’t really know a great deal about our area of New York State. Why should they? I freely admit that I don’t know much about many states in our union. It is too easy to look up information on “Google” when you need it and my United States Geography class was many more years ago than I care to remember. However, the conversation gave me an idea for this month’s blog, and I am grateful for that inspiration. 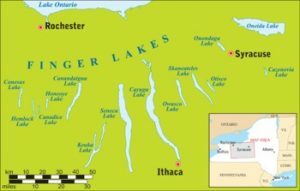 So, what are the Finger Lakes? 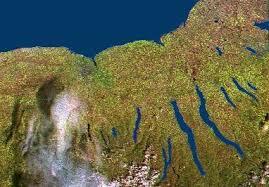 The Finger Lakes are a group of 11 lakes formed when glaciers from the last ice age melted, roughly 10,000 years ago. As the glaciers retreated, advanced and retreated again they scoured the landscape of, what became, western and central New York State gouging out the deep, narrow valleys which became this lovely place some of us are privileged to call home. In 11 of the valleys water collected and lakes formed. The lakes are, from west to east; Conesus, Hemlock, Canadice, Honeoye, Canandaigua, Keuka, Seneca, Cayuga, Owasco, Skaneateles, and Otisco. All 11 lakes flow north and eventually meet up with Lake Ontario and from there flow out to the Atlantic Ocean. They range in size from Canadice Lake, which is three miles long and 0.3 miles wide at its widest point and a maximum depth of 95 feet to Seneca Lake, which is 38 miles long, and is the second longest of the Finger Lakes, but has the largest volume, estimated at 3.81 cubic miles, holding roughly half of the water in all the Finger Lakes. Seneca Lake has an average depth of 291 feet, a maximum depth of 618 feet, and a surface area of 66.9 square miles. The six lakes west of Seneca Lake are smaller, shorter and shallower than the eastern lakes. Hemlock and Canadice Lakes have no cottages on their shores as they are water reservoirs for the City of Rochester and have limitations on how they can be used by the public. 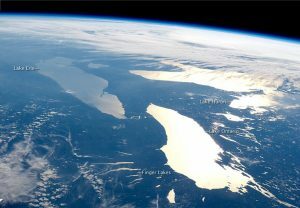 The Finger Lakes from space. These 11 lakes and the fertile land surrounding them consist of about 9,000 square miles which hold an agricultural land area that supports orchards, vineyards, dairies, grain and hops farms, sheep, and other food and drink related enterprises including wineries, breweries, distilleries, restaurants, fiber arts, and more. Geneva has always been an agricultural hub having many nurseries, food preserving operations and the New York State Agricultural Experiment Station (NYSAES) within its boundaries. Even though there have been periods of time when industry and bustling military bases provided this area with sound economic foundations, Geneva and the surrounding areas have never really left their agricultural heritage behind. There are four wine trails, over 100 wineries and over 80 breweries, cideries and distilleries in the area. We are actually becoming a farm to table destination for tourists seeking good food, good drink and a lovely natural setting. Even though the comment on urban areas of New York State (do they really cover the state from corner to corner?) isn’t specifically about the Finger Lakes I feel the need to address it. The answer of course is “NO”! As of the 2012 agricultural census, there were over 35,000 farms covering 7 million acres in New York which contributed $5.4 billion in gross sales value and $1.2 billion in net farm income to the national economy. Dairy farming alone accounted for $2.5 billion or 45% of sales. The Finger Lakes region is the center of state agriculture, and the state is a top-ten national producer of cow milk, apples, grapes, onions, sweet corn, tomatoes, and maple syrup. The Finger Lakes from the air. New York State is divided into 10 economic regions, but many residents see it as two regions – upstate and downstate. The boundaries are a bit fluid, but citizens often regard upstate as everything north of New York City and Long Island with the Hudson Valley area as a bit of both. Whether or not you include the Hudson Valley as downstate, the remainder of New York State is predominantly rural. Approximately 86.6 percent of New York State’s land area is rural. This amounts to almost 41,000 square miles in 53 counties. There are several large cities in upstate New York (Albany, Binghamton, Syracuse, Rochester, and Buffalo) plus several smaller cities, but they are urban pockets in a rural landscape. Geneva has a motto, “Uniquely Urban”, which reminds me that from the city center to the country is a drive of about five minutes. From the city center to the boat launch is also about five minutes. I could continue writing about the Finger Lakes for many more paragraphs, which would defeat the purpose of what was supposed to be a brief blog post. There are several good sites on line that will give you more information about our beautiful lakes, glacial geological features, tourist amenities, museums, and more.